YouTube channels are leading the way in sparking conversations online. Get inspired by creators who are producing content on important topics and making an impact. Learn how to do this on your channel and contribute your point of view on issues you care about. Make your voice heard and have an impact. There is an audience that is as passionate as you are about social issues, and YouTube can help you engage with them. Approximately 70% of the YouTube generation (millennials age 17+ who go online to do one or more activities a day) said YouTube is a place for social change (Ipsos 2017). Creators globally are making videos that spur change and conversation on topics like: xenophobia, racism, animal rights, the environment, and social justice (just to name a few). Today, it’s more critical than ever to share first-hand experiences and take a stand. You can help bring a voice to some of society’s most pressing issues--by contributing your thoughts, knowledge and point of view to the ecosystem and having constructive conversations with your audience. Producing videos is one way to help create a world where different viewpoints can be heard. Video is a powerful medium because it can heighten passions, awaken viewers to new experiences, make their hearts ache, educate, and even change the way people see the world. What change do you want to inspire with YouTube? You don’t need to fit a complex issue into a short video--studies have shown viewers are willing to invest longer viewing sessions into this type of content. This playlist highlights some of the work that YouTube’s Creators for Change are producing. How will you use YouTube to stand up for change? Abdel en vrai created a video about the role of women in Islam and uses research and history to disprove some common, preconceived notions. Think about social issues you see in your own community, or discrimination you have experienced or witnessed in the past. Is there something you’ve always felt strongly about but don’t know how to approach it? Is there a hot topic you’re interested in discussing with your audience? What’s the bigger picture look like and how can you use YouTube to contribute to it? 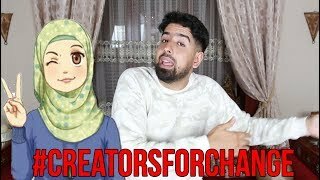 All over the world, creators are using their YouTube channels to discuss social issues and promote awareness, tolerance and empathy. For example, Humza Productions uses his comedy channel to also address issues like extremism, ethnic cleansing, and gang violence. John Green from the vlogbrothers has raised awareness of issues like the refugee crisis and the 2017 cholera crisis in Yemen. Vlogger Chescaleigh dives into topics like race and mental health. 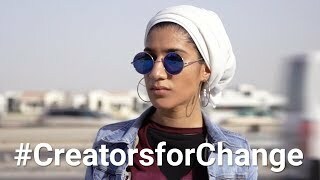 You can find many more channels engaging with social issues in the YouTube Creators for Change program, a global initiative supporting channels who are making a difference. Whether you’ve got an established audience or you’re just getting started, YouTube is a medium you can use to get your audience excited about a topic. Because no matter what kind of videos you make, you have the power to help create the world you want. So let’s get to it! Are you interested in sharing a positive story about diversity in your country? Could you weigh in on the conversation about the importance of tolerance? Is it important to talk about the role of women in your community? Maha AJ celebrates her Iraqi identity, Sudanese culture and life in the UAE and why it’s not always easy to explain where she’s from. Vlogger Subhi Taha shares a message of action and hope in this poetic video.